Today, the rarest of treats: the chance to find enjoyment in the actions of Coldplay. Brace yourself. No, I wouldn’t normally believe it either. But here it is, as plain as day, on their otherwise po-faced website – a joke! From Coldplay! Fetch the (Fair Trade) smelling salts, quick! As far as April fools’ day jokes go, this was a good one: self-effacing, fun and – by using the classic indie no-hoper’s ‘We just do what we do and if anyone else likes it, that’s a bonus’ line of doom – razor sharp. Begrudging respect now earnt, perhaps they could perform a double-whammy by retiring and allowing bands like Cake Teeth to edge into that vast band-void which they occupy. Cake Teeth‘s modus operandi sounds too simple to work effectively – the set-up involves a man called Steve on a laptop and a man called Sam on the guitar, and ragged, skewed music is the result. Maybe in the long run this simplicity will prove too limiting, but right now such strict perimeters are paying dividends in the shape of wonky and clattering ultra-lo-fi rock that sounds so alive, it could be being played in the next room. Vocals disappear into one elongated squelch, and drumbeats are as crisp and skinny as fresh celery. 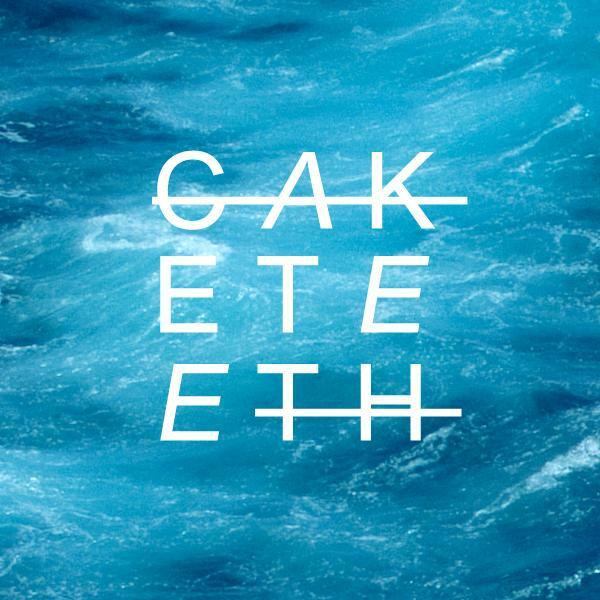 If anything, the bare guitar sounds out of place in such strange and unrefined environs, but I get the feeling that Cake Teeth make music for themselves alone. I also imagine that if anyone else likes it, they’d consider it a bonus. Make their day. >Today’s New Band – Run Toto Run PLUS! ‘The New Oasis’ – again! >Yesterday, in the Guardian, Alan McGee claimed that Liverpudlian band The Grants were, “The best unsigned band in the world.” Alan McGee has a habit of making big, provocative statements, and it’s reasonable to imagine that this is another of them. I think most people are willing to put up with these near-biennial claims, seeing as he’s the guy that signed Oasis and Primal Scream, bankrolled My Bloody Valentine to the point of personal/financial breakdown and had the nerve to release Kevin Rowland‘s My Beauty. So, are The Grants the best unsigned band in the world? Or the next band to be lumbered with the ‘New Oasis’ tag? Well, pop over to their Myspace page and judge for yourself. To me, they dally somewhere between those other Liverpudlian greats, The La’s and Echo and the Bunnymen.They sound big, expansive and masculine but a bit tender with it. Oasis were like that too, when they were good. Perhaps Alan’s onto something. He’s been right before. But then Alan McGee is good at raving about bands. Time will tell. If The Grants are The Best Unsigned Band… In The World!, then where does that place all the unsigned bands that have sloshed around A New Band A Day these last few months? There have certainly been a few bands that have made me more excited, more happy and more keen to pogo around my bedroom, but then we at ANBAD aren’t really in tune with the section of the public that buys U2 and Coldplay records. For the rest of us then, here’s Today’s New Band, Run Toto Run, who have never been labelled anything by Alan McGee, and perhaps are all the better for it. Run Toto Run are unlike The Grants in so many ways – they have a neat line in delicate and fragile folky songs, which are serious and carefree all at once. Your Face has the temerity to rescue the recorder from Primary School Hell and use it (sparingly, mind) in a way that doesn’t induce instant migranes. It’s a simple love song, unknowing, unpresumtuous and uncool. It’s lovely because of all those things. Something To Say wafts into your life, backwards and confusing, charms you to your very core, and then drifts out again, fluttering eyelashes at you coyly. If that sounds similar to what it must be like to be seduced by Russell Brand, perhaps it is, except much less faux-Dickensian. Something To Say is the best example of Run Toto Run‘s ability to create cute ‘n’ sincere folked-up love songs, and if it doesn’t leave you a bit dewy-eyed with happiness, then it’s time for a long, hard look in the mirror. And then listen to them, here! 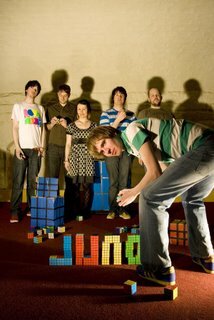 >Today’s New Band – Juno PLUS! Picking Up Bad Vibrations! I always contended that there was no sound that was so awful that some sort of pleasure couldn’t be derived from it if arranged properly. Look at the Drillcore scene and some of Aphex Twin‘s more esoterically ‘difficult’ music for ideas. However, I now realise that I was being wildly optimistic and probably a bit tree-hugging-peace-and-love to boot. There is, it turns out, such thing as irredeemably bad noise, and it’s currently being vibrated into me at about 100 decibels. The weakening effect of the noise has shaken out a confession: I should have picked up Today’s New Band, Juno, a good twelve months ago. Shocking isn’t it? In an attempt to put a positive spin on such a poor showing, I’m convinced that this is purely because there is so much good new music around at the moment that they just never got through. Juno should have popped up on my radar almost instantly because of their association with Manda Rin, of Bis fame. She pops up here and there on their songs, puncturing the noise hyperactively and as idiosyncratically as ever. On Party Music, the lolloping relationship between the guitar and drums reminds me a bit of Happy Mondays, and this can only be a suitably happy comparison to draw. Jet Set Juno is a weirdnik Teen-C/electro-rock squash-up that sounds like it belongs as the theme song to the imaginary TV show featuring the cartoons you used to doodle at the back of French Class at school. These Boys Are Athletes has been rattling around for a year, but it’s still as much of a chant-along futuro-pop monster as it was a year ago, all power chords and carefree bleeping. It’s always a joy to hear a band that are clearly drawing a huge amount of fun just from being in a band together. Juno are like that. It’s an even bigger joy when the band in question make music that’s just as much fun to listen to as well. Juno are like that too. Juno‘s songs would go down just as well in an Indie disco as in a roomful of sugar-buzzed 8 year olds. That’s about as happy a recommendation as you’ll get. So check them out here! >Rock ‘n’ roll depends on surprises for its excitement. Just look at Coldplay and their plodding snooze-rock as an example of how predictability ruins any attempts of thrills. This is why Chris Martin, who is, remember, signed to a multi-million pound record deal with the multinational company EMI, writes Fair Trade slogans on his hand, and names his children after fruit. No-one seems to have pointed out to him that a simpler way of appearing ‘edgy’ would be to record some songs that don’t sound as if they are explicitly written for car adverts. Today’s New Band, Transmittens, are all about surprises. Their name and music pops a big, happy, colourful clown’s balloon in front of your face, and because of that it’s easy to miss the glumly sung lyrics while you’re happily running around in the subsequent glitterstorm. Transmittens are a little bit like a down-tempo Bis. Not only is their sound reminiscent of an acoustic, less Japan-o-frenzied approach, but their cuteness is similarly tweaked to a more introspective level. That’s of course, assuming, that introspective cuteness is even possible. Up All Night isn’t a tale of rock ‘n’ roll excess at all, but a story of someone not being able to stay up, even thought they’d like to. In Our Dreams the nursery-school melody disguises lyrics as grim as “Why oh why did we come all this way to say goodbye? Because dreams don’t come true – but we thought maybe they do,” and Saturday Socks is so stupidly upbeat that the glum lyrics get missed because you’ll be happily shaking your head like a 1960’s Top of The Pops audience member. So, as such, Transmittens are a lovely mind-melting band, coating gloomy lyrics with so much sugar, you’d be happy to gulp them down all day long. Listen to their great songs here! >A New Band A Day is a fairly broad church with regards to our personal philosophy on what we like bands to sound like, but if we were to nail our colours to one mast, the ‘made-in-our-bedroom’ sound would probably be it. While some bands pride themselves on sounding slicker than a seagull the day after Exxon-Valdez decided to pop a rivet, others shun ‘production values’ and just get on with making great songs. Rough-and-ready bands sound like they could be playing on your sofa next to you, and usually are all the better for it. So, with that in mind, here’s Today’s New Band, Magpied, a band who relish the challenges put to them by Bontempi Keyboards and £69.99 guitar & amp deals from Argos. And meet those challenges they did, by cobbling together a bunch of songs which leap uncontrollably between “slightly bonkers” and “deliriously happy”. Downloadable-for-free song SCRAPS nightstatcher REMIXXX is a lost 1970’s kid’s TV show theme tune, tinkling, bouncing and vaguely promising edu-tainment; whilst It Hibernated sounds like one of the instrumental tracks off David Bowie’s Low played as a demo function on a child’s keyboard, crunchy drums and all. There’s also a super cover of Los Campesinos’ You Me Dancing, as if you needed another reason to listen. Magpied are small, in gestation and from Norwich. All of these are good things. They say they are ‘wanting gigs’, and frankly they deserve them. A duo this crazily delightful deserve a wider audience. Go nuts, and get your ears around their ace tunes here. >Life is cyclical. Just as day follows night, high tide follows low tide and a spell in jail follows Pete Docherty’s latest proclamations of sobriety, after yesterday’s Tinnitus-induced/-replicating NOISE-fest from Kayaka, it was inevitable that Today’s New Band would be a less thrash-tastic affair all round. As my Public Enemy-based tinnitus fades slowly into the background and telephones become helpfully audible again, the choice of music that my throbbing ears can cope with is still severely limited. However, choosing non-ear-threatening music is to wander through a minefield of awful sounds. Soft ‘n’ smooth jazz-moron Kenny G would be sonically inoffensive, yet could cause Death By Bland. So what is needed is a band that is exciting enough to be enjoyable but one that doesn’t utilise powertools as their main instruments. Step forward Today’s New Band, Heartbeeps. Perhaps the best description for their sound would be ‘Not-Quite-Noise-Rock’ – there is a lovely drone-iness to their music, which is a happy marriage of super lo-fi and super-melodic. Glacial Valleys is probably their best song, clunkily lo-fi, vaguely Beta Band-ish, whilst Tramwajs is a symphony on toy instruments, nicely strained vocals and a male voice choir singing through paper cups. Heartbeeps sound homemade and unfocused, but in the very best kind of way, like a child’s telescope made out of toilet rolls. Listen to their songs at their MySpace page here!